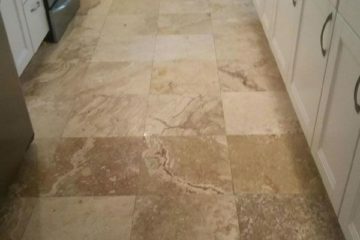 Travertine is made of a limestone material that is quarried from the earth. It is cut into tiles which may be used for floors or walls. 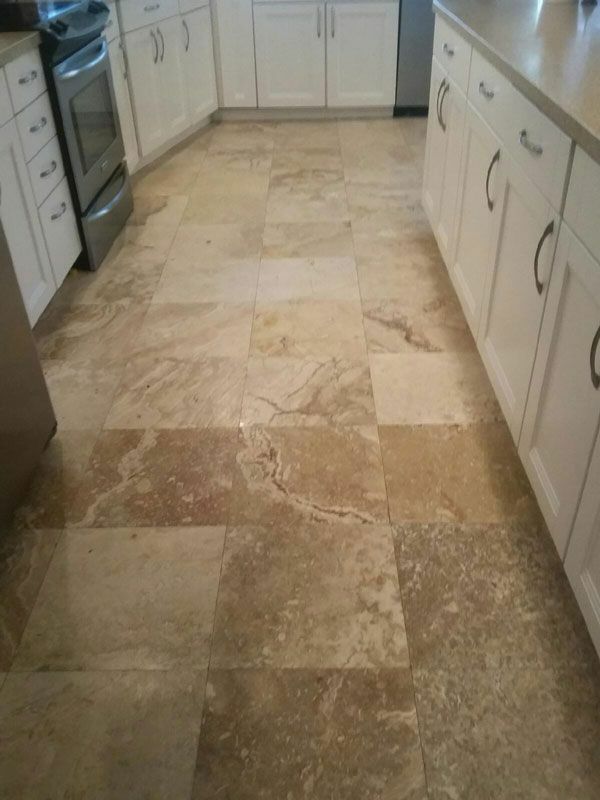 Because some travertine tiles are very porous they may need to be filled. This is usually done at the factory. In older floors sometimes holes develop but they can be easily filled and will blend in with the rest of the tile. 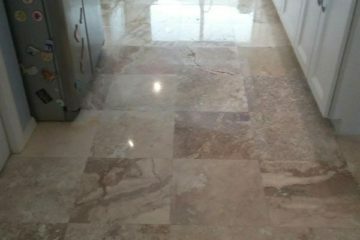 Travertine tiles maybe honed at the factory but it is not uncommon for the tiles to be installed without being honed or polished. Some customers leave the floors unpolished while others prefer varying levels of shine. 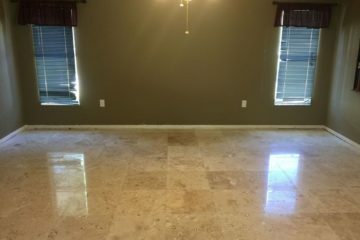 Travertine floors can be honed to a satin finish or a mirror like shine depending on your personal preference. 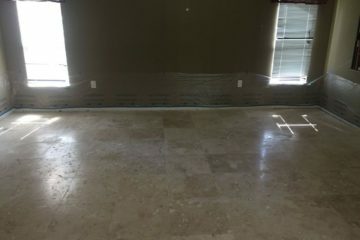 The installation of travertine floors can be tricky. Great care must be taken to insure that the tiles are laid flat. 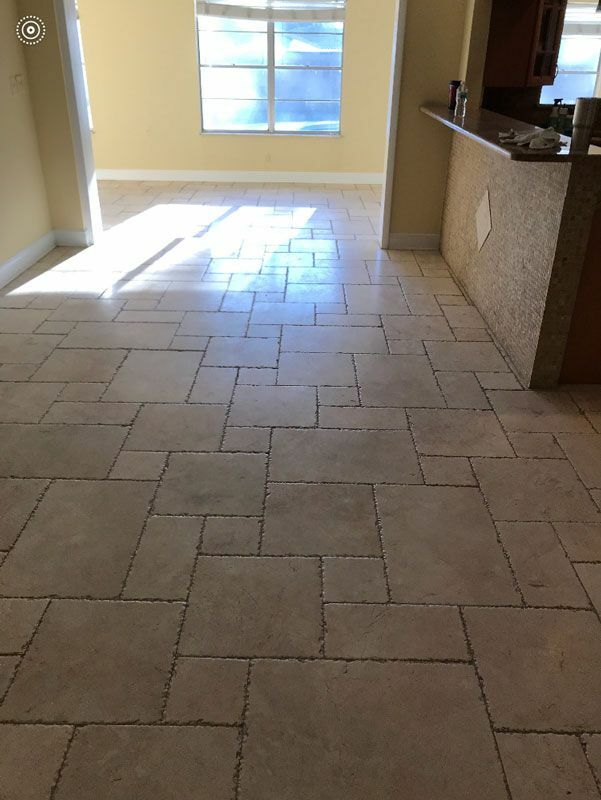 Because tiles vary in thickness lippage may occur which is where one tile sits up slightly higher than the adjacent tile. This situation can be corrected but requires more steps than if the floor had been correctly installed. 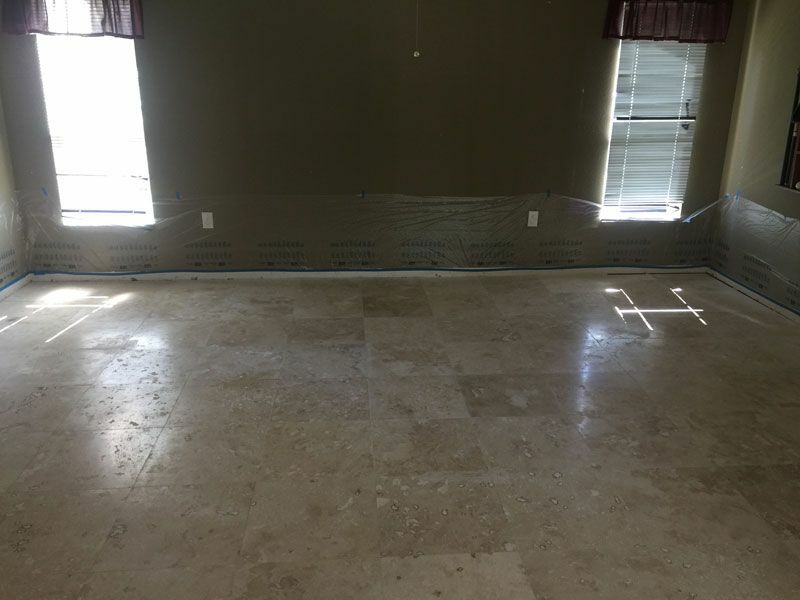 A complete restoration of travertine floors involves taping all of the walls, cabinets and appliances with plastic to insure that we will leave your rooms as clean as we found them. Next the holes are filled and the grout lines are cleaned. Now we’re ready to begin honing the floors. Honing is wet sanding using a series of diamond impregnated pads that will remove scratches and smooth the floor. At this point we are ready to polish the floor using a mild acid compound and a weighted floor machine. 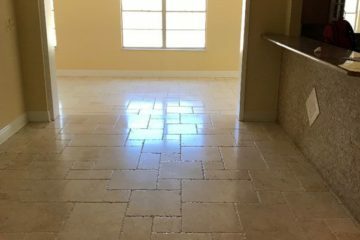 Some travertine floors such as chiseled edge travertine only require cleaning and polishing. 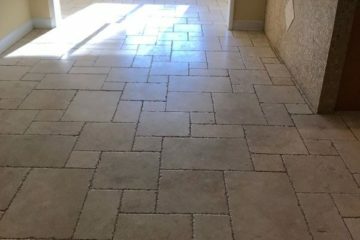 Using a high PH floor cleaner along with a high pressure hot water rinse system the tile and grout are thoroughly cleaned. Floors are now ready to be polished using a mild acid compound and a weighted floor machine. This process will leave the floors clean and restored to its original satin shine. 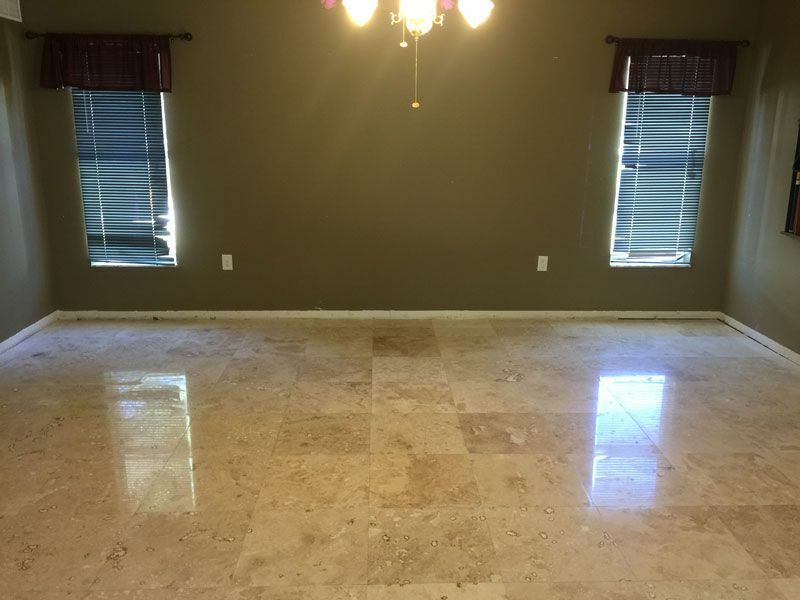 Marble floors typically come from the factory with a high polished shine. Over time, the tiles can become dull in the high traffic areas or scratched. 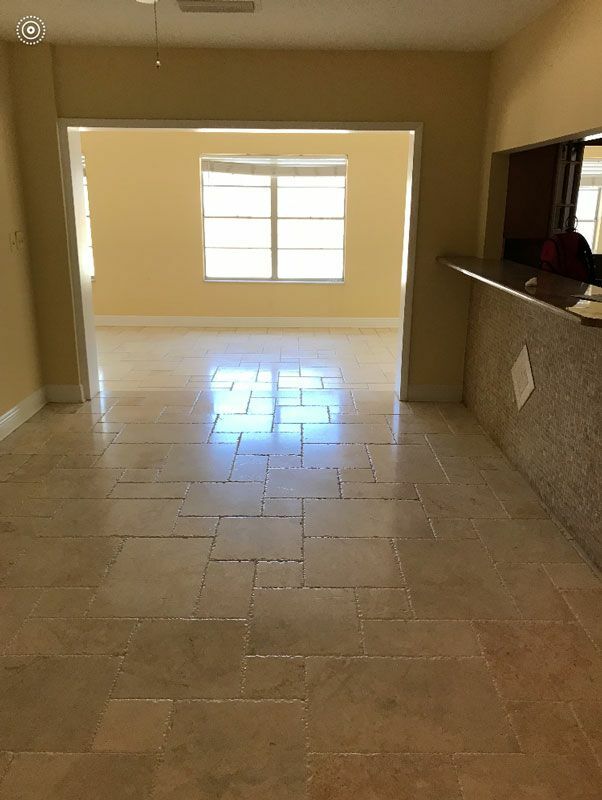 The dull areas and scratches can be removed by honing the floors using a series of diamond impregnated pads followed by polishing the floors to a high gloss shine. 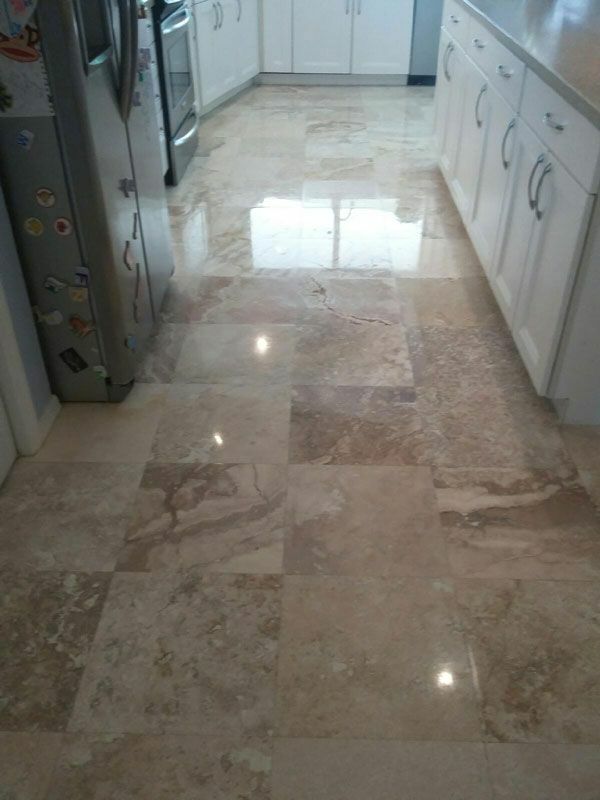 Call us to arrange for a free test spot which will allow you to see just how beautiful your travertine or marble floors can be.